Deionized water is processed to remove all the ions. This means the water has no charge, making it an excellent choice for cleaning. You may be thinking that deionized water is the same as distilled water, but there are some major differences in the two. Both distilled and deionized water result from treating tap water to remove unwanted contaminants. Distilled water is boiled, condensed, and collected. Distilled water removes particulates and dissolves salts as well as non-volatile organic compounds. The boiling process also kills some bacteria and viruses. Deionized water is obtained by passing tap water through ion exchange resins containing proton and hydroxide ions. While this method successfully removes unwanted ions from the water, it may not remove unwanted bacteria, which is fine if you are not drinking the water, but using it for cleaning your windows. 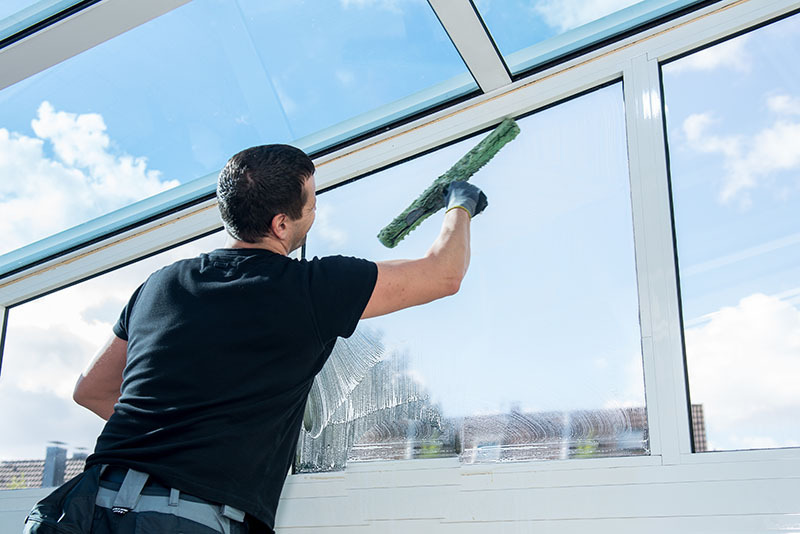 How does deionized water clean windows so well? Regular water from your outside tap is full of minerals that leave deposits on your windows, leaving a film that may be barely noticeable while your windows are wet, yet, when dry, leaves your glass with a foggy appearance. Hot deionized water leaves no mineral deposits on the glass surface. There is no need to squeegee or dry the glass after rinsing with deionized water because it dries naturally to a crystal-clear shine. Non-biodegradable and toxic chemicals pollute and persist in the environment, where they enter the food chain and cause harm to aquatic life. Detergent phosphates can cause eutrophication (algal blooms leading to depleted oxygen and death of animal life), upsetting the balance of nutrients in streams and marshlands. Although processed to remove ions, deionized water is a natural product. We use natural cleaning products that are biodegradable in our cleaning process. This means that no environmental damage is caused by our cleaning services. Deionized washing systems are a new technology designed for superior cleaning, and use it on every window cleaning job we do. Our filter system effectively removes all mineral ions to produce high quality water without developing scale buildup. We wet-brush the glass then rinse thoroughly, leaving the glass completely streak free. Call us for your free consultation.